Gary becomes involved at the Race Street Project and meets the director, Susannah Hart. Melissa meets Russell Weller, an artist. Gary and Melissa decide to have a kid together, but back out eventually. Gary is frustrated with teaching and his lack of progress toward tenure. Melissa has been working on wedding photography. Michael and Hope are over at the loft and Gary keeps asking questions about how Michael feels about his calling in life and Michael gives a pat answer about having Janey now and being a father (as he's showing the sonogram of the new baby). After Hope and Michael take off, Gary and Melissa compare rejection notices to make themselves feel better. Gary has started volunteering with a tutoring program, but the kid (Curtis) seems to hate him and Susannah Hart, the director, never has time to meet with him. They have a bit of a conflict, but Susannah agrees to think about Melissa goes to shoot a wedding and hits it off with Russell Weller, a young painter (the bride was his first "real" girlfriend.). Gary meets with his "kid" from his the Race Street Project and they definitely don't hit it off. While playing football on the lawn at Hope and Michael's, Melissa and Gary jokingly talk about about having a kid together. Michael takes it pretty seriously, so he drops by to see Gary and find out if they were kidding. Gary seems to actually be thinking about settling down and seems to resent Michael's implication that Gary might not be capable of being focused or faithful. At Russell's party, Melissa overhears him on the phone and figures out that he's gay (one of his friends has just been diagnosed with AIDS). They talk a little and it doesn't seem that his orientation will be a barrier to their friendship. 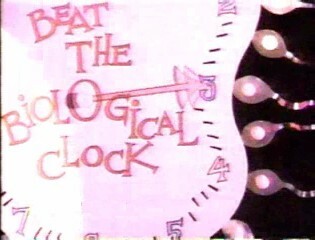 Melissa has a nightmare in which she's on the gameshow "Beat the Biological Clock" hosted by Montey Ovary with assistants Nancy and Hope (looking extremely fertile and pregnant). Gary goes the Race Street Project to resign from tutoring Curtis, finds out that Curtis is in court with Susannah, and then chases down to the court building after them. Gary goes to the Project and apologizes, but finds out that it wasn't Curtis who was in trouble, but his brother Jackie. He still decides that he's not the right person and backs out of the program. Melissa quizzes Russell about whether or not she should have a kid with Gary. Russell tries to offer calm advice, but Melissa seems pretty set on going ahead and isn't really listening to Russell's advice anyways. Melissa has the loft decked out with tons of candles and Gary brings a bottle of wine when they get together to discuss having a kid (she claims the power has been flickering because of the storm). They get very worked up about the potential problems, then seem to resolve that they'll work through whatever comes along, and sleep together (though that's not terribly clear). Curtis comes to visit Gary at school to say that he was impressed that Gary came after him, so they reach an understanding. Melissa goes to visit Russell and deliver some photos she took for some band friends of his and he confesses that he thinks her having a baby with Gary is her piece of insurance against the future and that it's a mistake. He gives a nice speech about not being afraid of the future, but accepting it. She tells him that she slept with Gary the other night, that it "just happened," and whatever happens will happen. Gary shows up at the loft bearing flowers and he and Melissa come to roughly the same conclusion, that it would be a mistake for them to have a kid, but still swear to be there for each other. Melissa tells him that she's not pregnant (she got her period early), and they both seem to be all right with the resolution. Melissa wears one earring (an amazing large chunky thing that looks like a globe on a stand). At Russell's party, she wears two earrings though and this weird little navy hat that makes her look like a midshipman. Russell mentions her jacket with the numbers on it (which is Japanese). Later someone slaps that black headband on her that makes her hair erupt upwards. Gary wears the gloves with the tips cut off and the Knights jacket. SAT scores only come in multiples of 10, so Gary couldn't possibly have gotten 751 or a 569 on them. That's just plain bad research. And it's inconsistent with what his verbal scores were reported to be in other episodes. Janie has written in with her recollection, stating that what had been cut from "trust me" was perhaps a few more seconds of kissing between Melissa and Gary to better develop the idea that they were about to jump into bed. I have just reviewed my tape from the 3/6/98 airing of the episode on Lifetime and the scene between Gary and Melissa leads up to a logical point where they really do want to have a child together and then it abruptly cuts. No kiss, no nothing. She does say a few scenes later, to Russell, that she and Gary "made love the other night, it just happened." I'd contest that, given the fact that they'd gotten together for the purpose of planning to have the kid, with the candles, and the wine. Looked pretty darned pre-meditated to me. Janie Guyton has noted that the football game on the lawn is almost exactly like the scene from The Big Chill. Gary states that "It's my problem, I take responsibility for everything" which seems to be the ultimate contradiction to his personality as presented by the show. Everything that we know about Gary screams just the opposite. Gary keeps hurting Melisa and running out on her--how on earth could she conceive of conceiving with him? This is very human, a willingness to believe that the other person will change if you love them enough, if you give them what they want. And it's still incredibly stupid. I would think that the writers would give the Melissa character more credit than they do, particularly in light of her impassioned speech to him at the end of "but not for me" in which she declares that he'll never hurt her like this again. And then she lets him. Overall I felt this episode was rather unfocused and muddled. I never felt that Melissa and Gary's joking remarks carried any kind of weight at all, and certainly not enough to make Michael concerned enough to hunt down his friend and quiz him on the possibilities. The topic should have been introduced in a more serious manner. And usually the subplots seem to relate more closely to the main topic, but I had trouble connected Russell and Race Street up with Melissa and Gary. I suppose that one could say that Russell made Melissa appreciate the passing of time and thus hastened her desire to ensure "immortality" with a child, if not a relationship. And, I suppose, Gary's experience with Curtis could be teaching him something about responsibility and thus preparing us for his other commitments that emerge in the next few episodes. I suppose. Oh, and I really hate the final speech. That bit about raising two kids (each other) and then saying goodbye to those kids, ugh. Just awful. Too pat, way too easy. Melanie Mayron and Peter Horton looked like they had guns held to their heads when they read the lines.